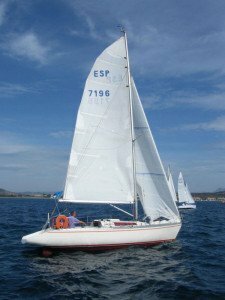 Wasa 270 was launched as an entry boat in 1982 and by 8.3 meters in length, about 28 feet, she was an affordable and accessible option, especially for young sailors who appreciated a speedy boat with racing feel. Leif applied his favorite concept, a quite narrow hull with small displacement. All in it for the boat to sail fast and joyful. Wasa 270 is the only Wasa boat that has a base interior in plastic, giving the little boat a bright and clean feel under the deck. Teak bulkheads and drawer units contrast nicely with the white plastic. Just under twenty boats were built until the mid 80’s.